The most exciting chaser in training maintained that status with an easy victory in today's Grade One Doom Bar Maghull Novices' Chase. 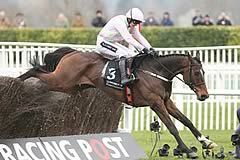 Douvan's only defeat in 11 races came on his debut over hurdles while trained in France, but he is unbeaten for Ireland's champion trainer Willie Mullins, and secured his fifth straight win over fences with today's success. Starting as the 2/13 favourite, he beat runner-up The Game Changer by 14 lengths but was hard held by jockey Paul Townend. This victory completed a quick double for Mullins and Townend who combined to win the previous race, the EZ Traders Mersey Novices' Hurdle, with Yorkhill. That horse pulled far too hard and gave Townend a difficult ride, but Douvan was simply push-button. Townend said: "It's a long time since I last rode him in a race [at Gowran Park in November 2014] - he's just different league. He covers so much ground and does everything so simply - he's a machine. Any course is straightforward on a horse like him. "He had a little reach at the ditch the first time but after that, when he got into a rhythm over the fences down the back, he was deadly. There was no plan to take it up off the home turn, it just happened like that. Andrew [Lynch on early pacesetter Alisier D'Irlande] made a mistake at the cross-fence and I didn't want to disappoint my horse by taking a pull. The plan was to keep it simple and we did. It opened up between the last two, I gave him half a squeeze and he just took off underneath me." Asked if this was the best he has ridden, Townend said: "It would be a fair one to get close to him, certainly as far as chasers go. "You are in it to ride horses like that, so if you couldn't get excited about days like today, you never will. A bit of pressure has never done anyone any harm - it keeps you sharp and on the ball. In fairness to Willie, since I started riding for him, he has had me riding in a lot of good races." Of his ride on Yorkhill, he said: "He was just too keen. He just wanted to charge, and must have a fair engine to win like he did. Not for one minute did he give me a bit of peace - he was just dragging and pulling me all the way." Douvan remained the unchanged 5/4 favourite for next year's Betway Queen Mother Champion Chase with Coral. He is 16/1 for the Timico Cheltenham Gold Cup with the same firm. The Game Changer finished 14 lengths behind the brilliant Douvan, with Fox Norton a further 18 lengths away in third. The Game Changer is trained by Gordon Elliott and was ridden by Bryan Cooper, and went off at odds of 8/1. Neil Mulholland trains Fox Norton, ridden by Noel Fehily, who was a 14/1 shot. Elliott said: "He ran a great race. Douvan is a different class, but we picked up plenty of prize money. We'll probably go to Punchestown now." Bryan Cooper said: "My lad's run really well. He travelled and jumped great. Douvan is just in a different league, but it was a big improvement from Cheltenham [where he finished fourth in the Racing Post Arkle]. Mulholland said: "Fox Norton got the season off to a great start with two wins [at Huntingdon and Market Rasen], was second in a Grade Two [at Cheltenham in November] and then third in two Grade Ones [in the Racing Post Arkle at the Cheltenham Festival and now Aintree] - we're very happy and it's been a good year for him. "I think we'll call it a day for the season now; he was in early, and he was a new horse to me [Fox Norton was previously trained by Nick Williams] so I wanted to get him out before the big guns did. The owners are absolutely thrilled and, touch wood, he's had good clean rounds of jumping all year."